Industry watchers have been anxiously awaiting this moment and it's finally here. The double chin-melting shot Kybella now has FDA approval. This first-in-class injectable targets the under-chin fat that forms the dreaded double chin. This area is resistant to the weight-trimming effects of diet and exercise. Before Kybella, the only way to address this trouble spot was surgery such as a neck lift or liposuction. Both procedures, while effective, also have their fair share of risks and downtime. Double chins have become even harder to hide due to the ever-increasing popularity of selfies, and social media in general. The chin or neck tends to take center-stage in these images. In a recent survey of facial plastic surgeons (conducted by the American Academy of Facial Plastic and Reconstructive Surgery) one in three respondents reported an increase in requests for procedures due to patients being more self-aware of their looks on sites like Facebook, Instagram and the like. 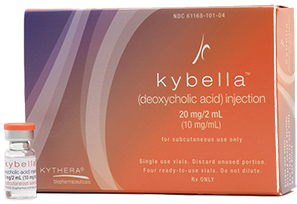 The active ingredient in Kybella (formerly known as ATX-101) is deoxycholic acid, which destroys fat cells. It is administered via a series of injections into the chin area. Some people may need as many as 50 injections in a single treatment, with up to six treatments administered no less than one month apart. The fat cells are reabsorbed by the body, and results are typically visible within two to four treatments. More than 68 percent of people who tried Kybella showed at least some double chin improvement according to the studies that led to FDA approval. Kybella does have some caveats. For starters, it is only approved for use in the chin region  and should not be used elsewhere in the body. In addition, Kybella will not be effective for people who have excess amounts of fat or skin in their chin area, nor does it target skin laxity. Kybella does confer its share of risks  some of which may be serious, including nerve injury in the jaw, facial muscle weakness, and trouble swallowing. The most common side effects of Kybella occur at the injection site(s). They include swelling, bruising, pain, numbness, redness and areas of hardness. Kybella is expected to be available in June 2015 at which point cost information should become available.